Since our face is not the only part of our body that betrays our age before we can even lie about it, face and neck lift has been one of the most prolific cosmetic surgery combination for face rejuvenation in Thailand. This Face and Neck lift tandem is an invasive form of cosmetic surgery which allows our surgeon to access not only the facial muscles but also the muscle and tissues on the neck area for tightening. Face and Neck Lift in Thailand is usually done under general anesthesia and the surgery lasts for 4-5 hours at minimium. This procedure may be done in combination with other more minor surgical interventions such as upper or lower eyelid surgery, brow lift, fat injection or fat transfer, lip contouring and/or dermabrasion depending on the result that the patient wants to achieve. The incision for face and neck lift surgery often begins in the hairline on the temple region, then continues around the ear and ends in the lower scalp behind the ear. This incision enables Prof. Kunachack to access the underlying muscle and tissue on the patient’s face and neck for adjustment and repositioning, then pulling and removing the excess skin. A second incision under the chin to tighten the platysmal muscle may also be needed to further improve the sagginess of the neck. Though other variations of facelift technique can be combined with neck lift surgery in Thailand, the most commonly used technique nowadays is the mini-incision technique or the minilift especially if the main concern of the patient is the mid and lower face only. The use of the mini-incision technique also allows for faster recovery for patients as the operative time is significantly decreased along with the tissue and nerve trauma caused by the surgery. WHAT HAPPENS AFTER FACE AND NECK LIFT in Thailand? 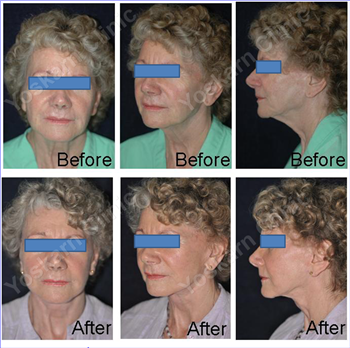 Face and Neck lift surgery often results in a more obvious tightening of the face especially the jaw and chin area, however, the test of a good a surgery is a younger yet natural look without the overly done appearance. Since it is a more extensive face surgery, swelling and bruising will last longer though the pain is usually minimal and can be easily controlled by medications. Drains may also be inserted during the surgery especially if liposuction is done on the neck but it will be removed within 24 hours after your surgery. Suture removal from face and neck lift surgery in Thailand will take about 7-10 days depending on the condition of the incision site. Staples on the temporal area will however stay for at least 14 days. Normally, patients are able to return to work in 2 weeks, though some degree of bruising and residual swelling may still be present during this time. Aside from our center being a one-stop cosmetic, dental, and holistic center, we also offer a more personalized treatment to all our patients as we believe there is no standard approach in cosmetic surgery. Before recommending a certain procedure, our surgeon runs a thorough evaluation of the patient’s bone structure, skin tone, and several other features, along with the patient’s desired result. We always make sure that we understand what our patients want and our patient knows the limitations of what we can do, and that both parties are in agreement with each other. Since we are located in downtown Bangkok, near the biggest shopping areas and touristic spots, patients can also stay in the hotel even before their scheduled surgery.